First Place Winner will also receive 4 gigs within the next 6 months. Second and Third Place will also receive paid future gigs. FINALS ON SATURDAY, OCTOBER 8! Congratulations to Zona Road for winning! Bands must be able to play COUNTRY MUSIC for at least 3/4 of their 4 hour show if booked. Finals will be on Saturday, October 8 at 9:00 pm. Three Judges will be on hand for each Qualifying Round and the Finals. **Each audience member and contestant will be given 1 vote and 1 point will be added to each person�s score for each vote they receive for that night only. Dirty Goat Productions will provide PA System, drum set, amplifiers, and microphones if needed and will schedule all bands. 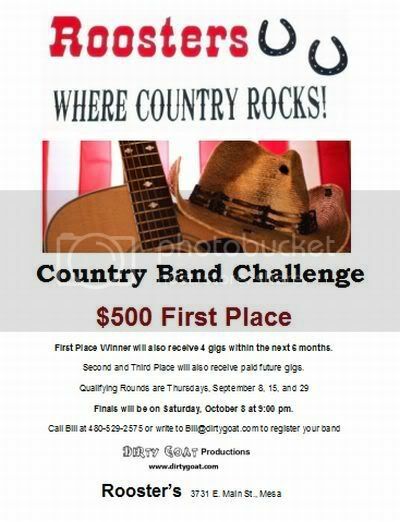 Call Bill Ludlow at 480-529-2575 or write bill@dirtygoat.com to schedule your band.